An information desk is available in the main lobby of the airport. The reception staff can inform travelers and accompanying persons on their flight, their experience at the airport or the formalities. Do not hesitate to call on them. Luanda International Airport has several financial services in different areas of the terminal: banks, ATMs and exchange offices allow users and travelers to withdraw, change and transfer their money at any time. Two lounges (VIP lounges) are available at Luanda International Airport. Access is restricted to business and first-class travelers from certain airlines and to VIP card holders. It is also possible to access it punctually by paying access fees. Pall Lounge: free drinks (non-alcoholic) and snacks (supplement for alcoholic beverages). Wifi and newspapers. Lounge reserved for TAP Air Portugal First and Business passengers as well as passengers paying a US $ 20 entrance fee. Lounge open from 6 am until departure of the last flight. TAAG Lounge: Lounge of the Angolan national company. Alcoholic beverages, snacks, wifi, international press and free self-service computers. Supplement for access to showers. Lounge open from 5:30 to 22:40. Salon reserved for TAAG First and Business passengers. Note: Kids Place , a leisure and activity room for children is located in the duty free zone to allow families to wait for the flight in the best conditions. Luanda Quatro de Fevereiro International Airport is home to many shops located in the public lobby, in the travelers' area or in the airport's outbuildings. The diversity of the products sold as well as the prices practiced make it possible to make purchases on your departure or on your arrival. Local gastronomy, optics, press, music, souvenirs, jewelery, crafts, ready-to-wear and luxury brands, electronics, telephony and computers, alcohol and tobacco are all products offered to users. Boutique Ango Duty Free: products usually available duty free (alcohol, tobacco, perfume, gifts, etc.). Open from 6h to 11pm. Brindes de Angola: souvenirs and crafts from Angola, in the duty-free zone. Chilli Beans: optician, sunglasses, open from 6am to 10pm. Rocrets: music, CD, culture, in the uty free zone. Luboia: diamonds and jewelry, in the duty free zone. O Boticário: cosmetics, open from 6am to 11pm, in the duty free zone. To send your letters, postcards and parcels, for your purchases of stamps and for the reception and the sending of money orders and Western Union transfers, the post office of the Luanda international airport is opened in the terminal every day from 8h to 20h. Luanda Airport is constantly concerned about the safety of passengers and aircraft. The airport police station is listening to all travelers. Security guards also ensure compliance with international standards. You can call on them to report any activity that you think is suspicious. In addition, we remind you that leaving an unattended baggage can lead to its destruction and to prosecution against you. Wheelchairs and support staff are available free of charge for passengers with reduced mobility to and from Luanda Airport. It is essential, when booking your flight or in any case before take-off day, to indicate to the company that you will need assistance on the ground and / or in flight in order to provide the appropriate help and to take you in charge upon your arrival at the airport and facilitate your check-in formalities and access to the boarding area. 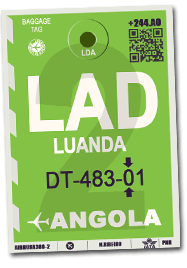 Each airline flying to Angola impose a different baggage allowance. It is important that every traveler comply with those rules under threat of being required to pay excess baggage fees that can be prohibitive. It is therefore recommended to weigh your luggage before you get to the airport. However, it is possible to weigh them on the balances available at check-in counters in order to lighten them if necessary. Passengers who have not had the time to buy their plane ticket or have missed their flight have the opportunity to buy their trip to the airlines on site, including the day of departure if seats are available. Travel agencies also offer this type of service as well as the sale of holidays and tours in Angola and around the world. Rucatur Travel Agency: Revolução de Outubro Avenue, in front of the airport. To ensure the comfort of its travelers and visitors, Luanda Airport offers a medical service for health emergencies (presence of defibrillators and trained personnel). In case of loss, theft or damage related to baggage carried by travelers, you must contact your airline as soon as you have knowledge of the incident, ideally at the exit of the baggage delivery hall. The airport has several cafes / bars / restaurants in its different halls. You can eat there or eat a variety of hot and cold drinks. Fast food (sandwiches) is also available 24/24 and 7/7.